Dr. Neeshat Khan is a Board Certified family dentist who serves the residents of the San Jose, California area. The doctor and her staff specialize in promoting good dental hygiene and other services that support good dental health. What is Involved in Good Dental Hygiene? Good dental hygiene involves caring for all parts of the mouth. In addition to the teeth, the health of the gums and other soft tissues must also be considered. A dentist will educate their patients on proper brushing and flossing techniques, as well as help them to choose the right oral hygiene products to use to keep their mouth healthy and disease free. It is also important for good dental hygiene to visit the dentist regularly. A visit to the dentist can point out a person's strengths and weaknesses, helping them to better take care of their teeth and gums. Practicing good dental hygiene is just one aspect of preventative dental care. How Often Should a Person Brush Their Teeth? Brushing is one of the most important aspects of preventative dental health. Dentists recommend that their patients brush their teeth for at least two minutes, twice a day. While brushing after every meal would be ideal, it is not always possible. Brushing for two minutes in the morning and again in the evening will kill germs and remove any debris that has been deposited on or near the teeth. It is also important to floss while brushing the teeth in the evening. Flossing removes debris from in between the teeth where it can become wedged as the person chews their foods. The dentist will help the patient to determine what type of bristle is needed. Most recommend soft bristles to prevent damage to the surface enamel of the tooth. Flossing is extremely important. Dentists recommend flossing along with brushing the teeth for two minutes at night. Flossing removes bits of food that can become lodged in the small areas between the teeth. 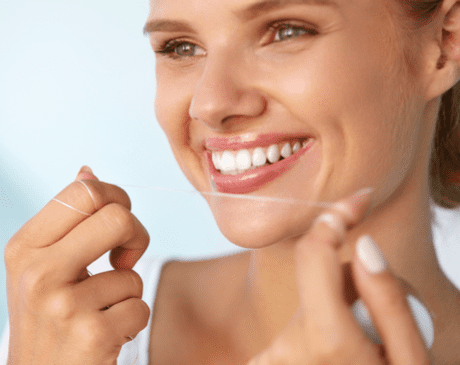 Bringing the floss downward, along the side of the tooth and just under the gum line removes debris, preventing it from breaking down the tooth enamel or irritating the gum tissues. Flossing helps to prevent abscesses that often result when decaying food finds its way under the gum line where brushing may miss it. At a patient's yearly dental checkup, the dentist can point out where a person's flossing needs improvement. They will also show them how to floss properly.